If your home has been taken over by a mice infestation in Crystal Lake , you should seek a professional mice exterminator as soon as possible. 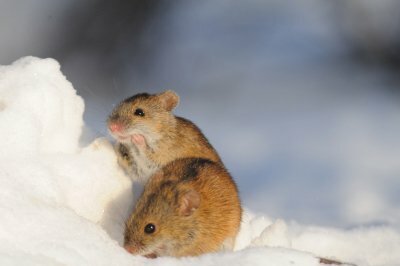 Mice and rodent control is particularly important during the winter months, as the risk of mice infestations increases as the temperature drops. Here is a look at some of the dangers of a mice infestation during the winter season. As mice begin to infest homes in an attempt to escape the harsh weather outdoors, they bring with them a variety of pathogens, bacteria, and germs. The larger your mice infestation is, the more mice droppings you’ll find throughout your home. These droppings can carry and transmit the Hanta virus, E. coli, salmonella, etc. Any human or animal that comes into contact with contaminated mice or rodent droppings is at risk of developing a dangerous virus or disease. In addition to spreading germs and disease, mice also destroy property in your home. Mice and rodents love to chew, and they will search your entire house for materials for their nests. They can chew holes in woodwork, electrical wiring, and they will chew and dig up insulation, upholstery, bedding, clothing, and other textiles in order to gather nesting material. When mice and rodents gnaw through electrical wiring or interfere with household appliances, they can cause electrical fires. As mice build nests, they will begin reproducing, and your mice infestation will become larger and larger. This is why mice and rodent control is so important. Frequent or prolonged exposure to mice droppings, urine, and hair can aggravate certain health conditions. When mice droppings dry, they can become airborne and will be breathed in by anyone in your household. Droppings and hair can trigger severe allergic reactions, asthma attacks, skin rashes, and other respiratory problems. These problems are more significant if anyone in your house is very young, very old, or suffers from a serious illness.